As you might imagine, we get a lot of questions on the subject of leather upholstery. While it’s not related to engines, caring for the interior of your car or truck is an important part of vehicle maintenance. Most leather upholstery in American- and Asian-made cars is plastic coated, with a surface layer made of vinyl. If your car is European, on the other hand, it might have “naked” leather, in which case the surface would be that of the original hide with no protective finish. Not sure which kind of leather is in your car? Find an inconspicuous area where you can apply a tiny droplet of water. If it leaves a spot, the upholstery in your car is not coated. While naked leather “breathes” and easily absorbs conditioners, it doesn’t repel liquids the way vinyl-topped upholstery does. For this reason, you’ll need to use a quality leather conditioner in addition to a cleaner. Look for products that are PH-balanced and safe to use on uncoated leather, to ensure you’ll restore your leather’s natural beauty and smells without removing color. The protective, plastic surface of vinyl-coated leather makes it virtually care-free. There’s no need to use a leather conditioner since it won’t be absorbed. 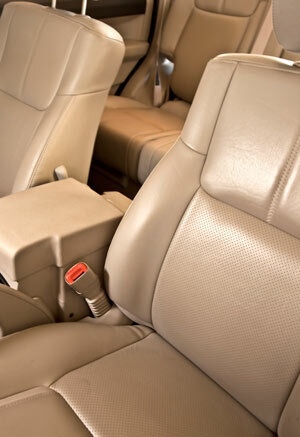 Instead, maintain your car’s seats the same way you would any vinyl upholstery. The best way to do this? After cleaning, use a high-quality protectant to prevent fading, cracking and stains.